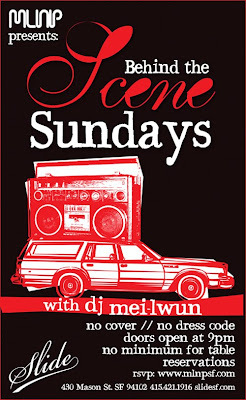 MLNP: DeeJay Consuelo funks you up @ SCENE this Sunday. MLNP makes SCENE Sundays @ Slide a must attend weekly event with the best DJs San Francisco has to offer playing for the crew who does the do!! Make it your weekly chill spot and round up a few friends to join the fun. Become an MLNP VIP. This SCENE Sunday Aug 16th features Deejay Consuelo playing hip-hop, house and uhhh hip-house. Make a table reservation now!! BTW complimentary table reservations for all MPNP VIP.